Where Should You Buy Your Next Home? The process of finding your dream home doesn’t have to be a frustrating one. If you don’t know what you want, your real estate agent can help you narrow down your must-haves to ensure that you find a property that you are going to love living in. What are some of the things that you should think about when trying to find your home? The first question that you need to ask is how much you want to spend. When taking this into consideration, keep in mind that taxes could cause one $200,000 house to cost $1,000 a month and another $200,000 house to cost $1,400 a month. You also need to consider whether you need to pay mortgage insurance because you don’t have a 20 percent down payment or because your credit score isn’t good. Other issues that you should consider include how many rooms you need, how much square footage your home should have and whether or not you need a large yard. If you want more space, you should look to rural areas while city living is encouraged if you want to be closer to nightlife and other entertainment options. Finally, you should take a look at where your kids will be going to school if you buy a specific property. If you don’t have kids, it may not be a good idea to buy a house in a good school district because your taxes may be higher. This entry was posted in Home and tagged things to consider before buying a home on June 20, 2014 by Yami. Do you know what it is like to be a curator or guardian of historical site? Let Alvin Alcid, the curator of Aguinaldo Shrine in Cavite, tell you all about his work. I met Alcid in 2004 while he and his staffs were busy preparing for the 106th celebration of Philippine Independence. Alcid, is the Division Senior Historic Sites Development Officer of the National Historical Institute. He took over the management of Aguinaldo Shrine the century old national treasure replacing retired curator Rosalinda Aguinaldo, the granddaughter of Crispulo Aguinaldo, who was the elder brother of General Emilio Aguinaldo. After the first curator, Corazon Andrade, Alcid is the third custodian of the century-old national treasure since Gen. Aguinaldo donated the ancestral house and its surrounding properties to the government in 1963. Gen. Aguinaldo died the following year. The National Historical Institute is maintaining the shrine along with other 29 historical sites and museums nationwide. Alcid got assigned in three shrines since joining NHI. He served as tour guide in Fort Santiago in Intramuros before he was transferred to the NHI Museum of Philippine Political History along Kalaw Avenue, Manila as curator. The Aguinaldo Shrine, which was originally built in 1845, sits in 1,300 square meter lot area. It had undergone several expansions and renovations since it was built in 1849. It is one of the prominent sites in Cavite. The two other sites are the Ancestral House of Baldomero Aguinaldo in Binakayan and the place where Andres Bonifacio was tried in Maragondon. The author with Alcid (partly hidden), taking a tour of the mansion. As a curator, Alcid maintains the orderliness of the shrine. He entertains guests, and supervises other activities like the birth and death anniversaries of Gen. Aguinaldo. He was also involved in book launching and networking with other historical associations of Cavite. Alcid loves to work at the shrine because he feels that he is part of history. He has access to historical relics which ordinary people do not have. “When ordinary people visit a museum, they will just look at a piece of history. But we, who work in the museum, are the ones who clean that item, read that particular document that you would not be able to read in any library or bookstore,” Alcid proudly said. All information herein was based on my interview with curator Alvin Alcid in June 2004. This is part of my feature article published by People’s Tonight on June 8, 2004. 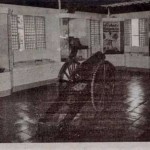 This entry was posted in Artifacts, Historical sites, Tourists destination and tagged Aguinaldo Shrine, Ancestral House of Baldomero Aguinaldo, Andres Bonifacio, curator Alvin Alcid, General Emilio Aguinaldo, historical sites in Cavite, Independence Day celebration, Maragondon, National Historical Institute, shrine curator on June 11, 2014 by Yami.